People often say there’s nothing better than hearing your favourite band live- the atmosphere, the noise, the energy. 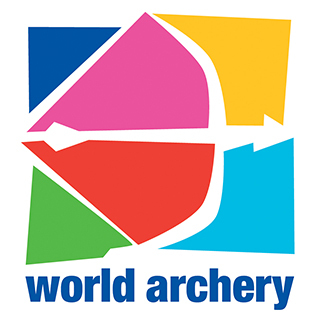 Well, this summer I found out that the same applies for a big World Archery event- no amount of live-streaming could capture the electricity of the finals field! 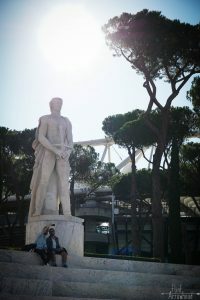 I visited Rome last month, while it was the home of the 2017 World Cup Finals. It completely blew me away. 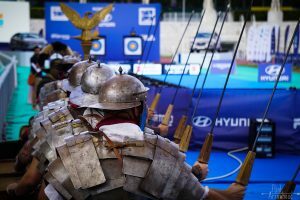 This was my first time in Rome and the first experience of a shoot this level, and it was brilliant- after usually seeing my archery heroes only on the livestreams, it brought them closer to home seeing them prepare, warm up and enjoy themselves shooting, almost like everyone else. The day before the finals kicked off I ventured down to get my bearings and meet the team. 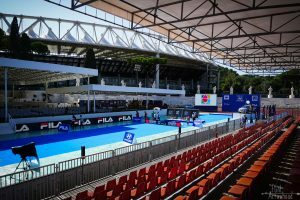 First entering the arena at the Stadio dei Marmi takes your breath away. Expansive red carpeting down into the venue was circled by huge white steps. It was almost enough to draw your eye away from the hundreds of marble sportsmen watching over the grounds. Aside from just the media and communications crews, there were over 150 contractors, staff and volunteers that had helped construct the venue and manage the event. There was a focussed, expectant air in the day running up to the competition as finishing touches were added to the finals field and cleaning staff gave the stands one final sweep. Everyone I met was welcoming and friendly, and seemed to take pride in their work. 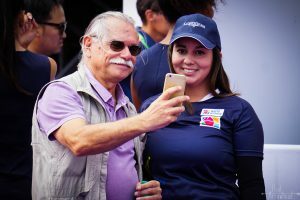 The field is the same format in each venue- it travels in cases from location to location around the World Cup Circuit, and is built by a team of over 50 people. Behind the match area, tents for sponsors as well as vendors selling local food and archery equipment are arranged for visitors and athletes to enjoy (the gelato was amazing). The space behind the field had a carnival atmosphere, and it was a odd to see the Roman re-enactment society members dressed in togas, playing table football and chatting before their interval performances. The finals field was ringed with seats for spectators- the stands for ticket holders, and shaded tables for VIPs and guests. Behind the stands, running perpendicular to the finals field, the practice field gave athletes space to practice, prepare and relax before their matches. The bustle of the crowds in the stadium was muted as the archers practiced behind it. Seeing the athletes in person rather than through a screen humanised them, made them relatable and attainable. 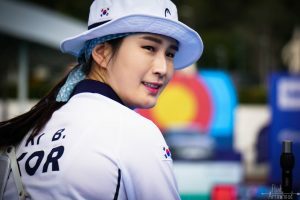 There was no doubting the grace of the Korean team (and I’ll be honest, I did fangirl a little when I saw them all), the upbeat attitude of the Americans, and the focus of the Dutch, each nation bringing their own spin on the sport. 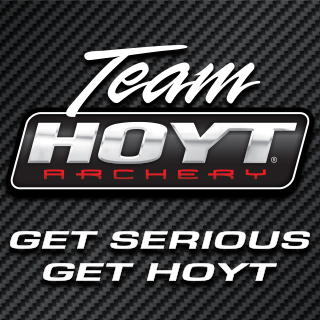 Watching the archers practice not only let me see a little of their team dynamics, but also gave a little insight into their mindset before a match- if they were unsettled this could translate onto the finals field. Both before and after matches, archers have a level of celebrity and are mobbed by fans. 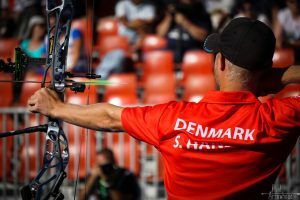 The patience of most archers was brilliant- after his medal match, Brady Ellison spent a whole hour taking photos with every single one of his fans until the crowd dispersed! Match-play was quick and efficient. Turnaround for target face replacement was less than a minute and the cameras are left rolling throughout. The amount of cameras surprised me a little, but combined together they provided a dynamic, engaging feed without interfering with the archers too much. Media staff are given free reign around the match field and that gave opportunities to take photos from new angles- if you’re going to stand in front of an archer to take photos, you’re safest in front of an Olympian after all! Photography here is not like at the club shoots I was used to- the match system only gives you a few arrows to work with and so each set counts! During the afternoon of Compound Sunday, I finally mustered the courage to wear the vest and get out there during the matches to take some photos. I was advised to avoid the line of sight of the cameramen, as interfering with the live broadcast was a huge no!  But otherwise, I could really get up close and personal with the archers as they shot. 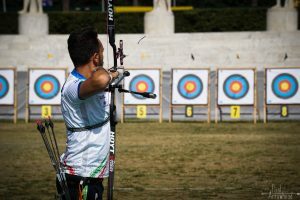 The matches themselves ran smoothly one into the other, and in the heat it was hard to keep up my energy through each match (and I realised the importance of the acclimatisation training some teams send their archers to do)! Being so close I felt I could just catch the arrows as they flew by, and it added a dimension to the match that wouldn’t be felt unless you were shooting it yourself. Seeing the engagement of the spectators in the stands added further depth to the scene. 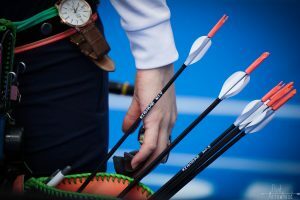 Crowds built up on recurve Sunday- the stands were packed and the roars of the audience for home archers and old favourites jacked up the excitement. In contrast, the silence in the stadium before a shoot-off was tense and if anything, louder than their cheers! 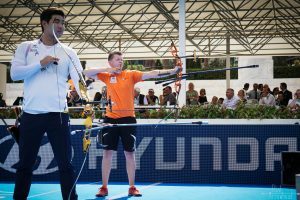 Capturing the pivotal moments- an arrow in mid-flight, the athlete’s emotions and the reactions to match outcomes- was extremely satisfying and being so close to the action felt incredibly immersive. Meeting and working alongside Dean also improved my photography- literally overnight! By thinking about what people wanted to see in the pictures, I focussed my efforts on getting the images that told the story of the match in a way that people could engage with. The same applied when editing pictures- in a scenario where images need to be ready almost instantaneously for reporting news, selection and editing must be ruthless and rapid. The whole experience was incredibly immersive and I wish I had done this sooner- it inspired my archery and my photography and given me focus for my aspirations in both. 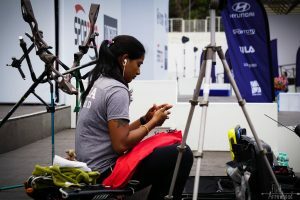 The experience of working, shooting and watching an international competition- I couldn’t recommend it more.